Investigate the motion of an object as it falls to the ground. A variety of objects can be compared, and their motion can be observed in a vacuum, in normal air, and in denser air. The position, velocity, and acceleration are measured over time, and the forces on the object can be displayed. Using the manual settings, the mass, radius, height, and initial velocity of the object can be adjusted, as can the air density and wind. This document is intended to support students in constructing explanations in science utilizing the claim... (more), evidence, reasoning framework for talk and writing. Students will collect data of different samples falling in a vacuum and in air. They will examine the da... (more)ta to determine patterns and then make a claim supported by evidence to answer the question "What makes objects fall at different rates in air but the same in a vacuum?" Free Fall simulate negative velocity and gravity with graphs. Great Lesson for understanding how objects on Earth fall due to gravity and how terminal velocity works. This Gizmo is truly robust to cross curricular connections..forces, vectors, rates of change, derivatives, functions, you name it! This Gizmo will be great to help change some misconceptions about freefall and gravity. 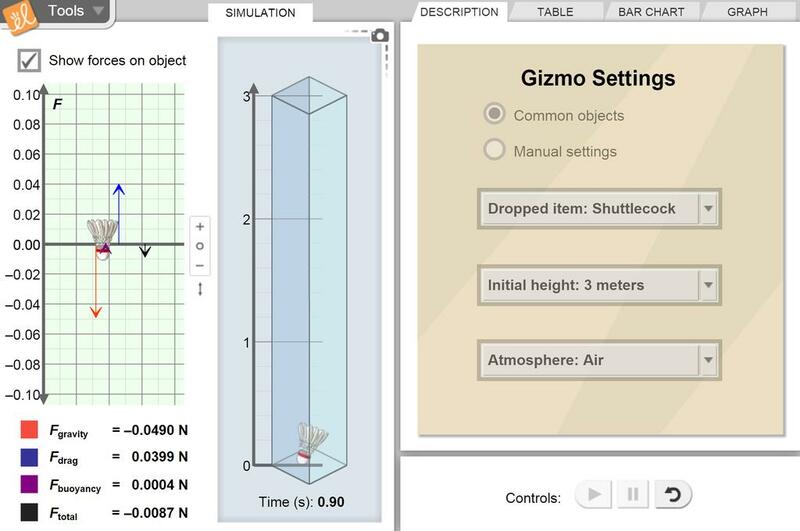 Great gizmo to work through intro physics topics all the way through advanced topics.